Theodor von Hörmann (1840–1895), Summer in the Garden, Znaim (c 1893), oil on canvas, dimensions not known, Die Sammlung Leopold, Vienna, Austria. Wikimedia Commons. Impressionism reached across the whole world, as far as Japan and Australia, but I can’t think of many Austrian Impressionists. One of the few – perhaps the only one – was Theodor von Hörmann von Hörbach (1840–1895). He didn’t paint seriously until quite late in life: he served his younger years in the Austrian Army, seeing action in the Second Italian War of Independence in 1859, then the Austro-Prussian War of 1866. After those, when he was 33, he started studies at the Academy of Fine Arts in Vienna, alongside those more than ten years junior. From 1875 to 1884, he taught drawing and fencing at a military high school in north-east Austria. Theodor von Hörmann (1840–1895), Southern Landscape (1878-79), oil on canvas, 38 x 48.4 cm, location not known. Wikimedia Commons. 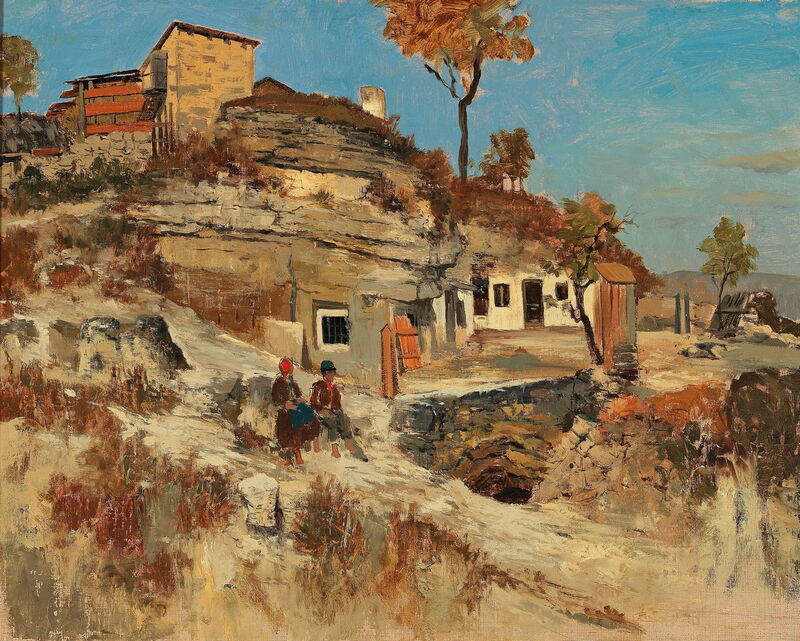 His paintings from this period include some wonderfully sketchy plein air views, such as this Southern Landscape from 1878-79, which appears to have been painted in southern Europe, perhaps in Italy or even Spain. Theodor von Hörmann (1840–1895), Mountain Slope with Trees (date not known), oil on canvas, 28.5 x 41.5 cm, location not known. Wikimedia Commons. Although undated, I suspect that this Mountain Slope with Trees also comes from early in his career. 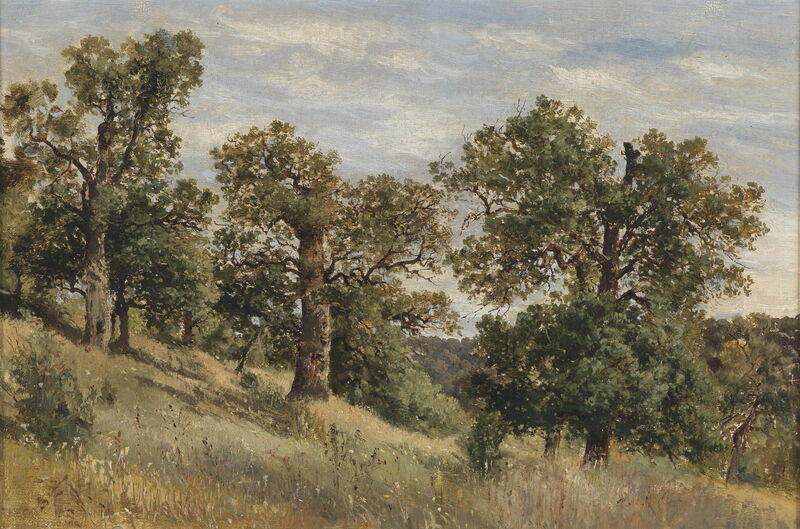 Theodor von Hörmann (1840–1895), Hungarian Landscape (1883), oil on canvas, 34 x 58 cm, location not known. Wikimedia Commons. 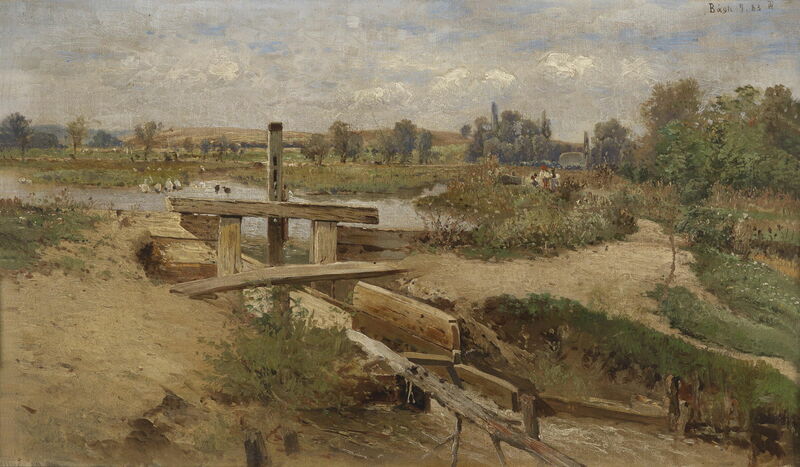 Around 1883, he seems to have travelled to Hungary, where he painted this fine Hungarian Landscape (1883). 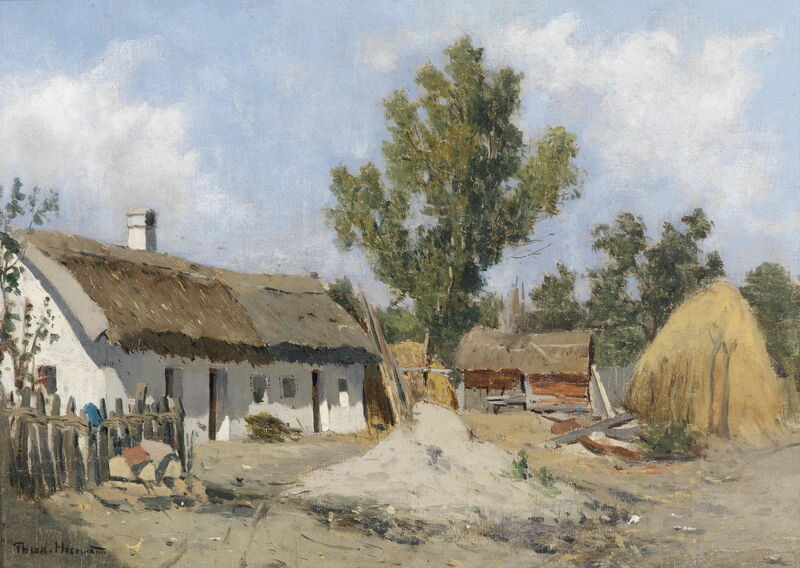 Theodor von Hörmann (1840–1895), Hungarian Farmhouses (date not known), oil on panel, 19.5 x 39.5 cm, location not known. Wikimedia Commons. Hungarian Farmhouses may also have been painted at around this time. In 1884, at the age of 43, he married, retired from the Army, and became a full-time artist. A couple of years later, he moved to Paris, where he lived until 1890. I have been unable to find any dated works of his from this period, but suspect that the next two paintings were made in those years when he came into contact with Impressionist art in Paris. Theodor von Hörmann (1840–1895), A Summer Day near Samois (date not known), oil on canvas, 69 x 101 cm, location not known. Wikimedia Commons. 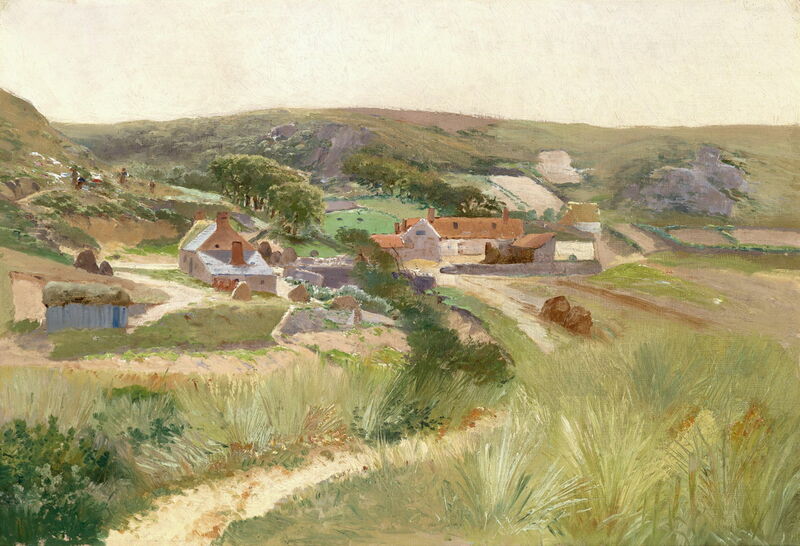 A Summer Day near Samois was painted, I think, close to the town of Samois-sur-Seine, near Fontainebleau. His treatment of the long grass is loosely rhythmic, and the painting light in tone. Theodor von Hörmann (1840–1895), In the Tuileries (date not known), oil on canvas, 38 x 55 cm, Österreichische Galerie Belvedere, Vienna, Austria. Wikimedia Commons. 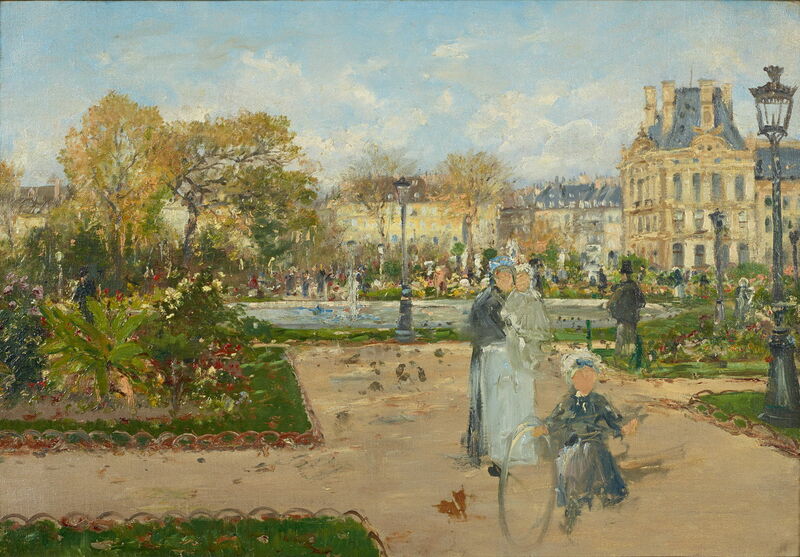 In the Tuileries shows these famous gardens in the centre of Paris, in what is clearly a brisk plein air sketch made in the late summer or early autumn. The child in the foreground is playing with a hoop. Von Hörmann apparently visited the Channel Isles of Jersey and Guernsey, but I have been unable to locate images of the paintings he made of them. Then in 1890, he moved back to what was then Znaim, now the South Moravian town of Znojmo in the Czech Republic near the Austrian border. Theodor von Hörmann (1840–1895), A Farmhouse (date not known), oil on canvas on wood, 23.5 x 33 cm, location not known. Wikimedia Commons. A Farmhouse was probably painted out in the countryside near there. Theodor von Hörmann (1840–1895), Girl in Poppies (c 1892), media not known, 47 x 38.5 cm, Österreichische Galerie Belvedere, Vienna, Austria. Wikimedia Commons. 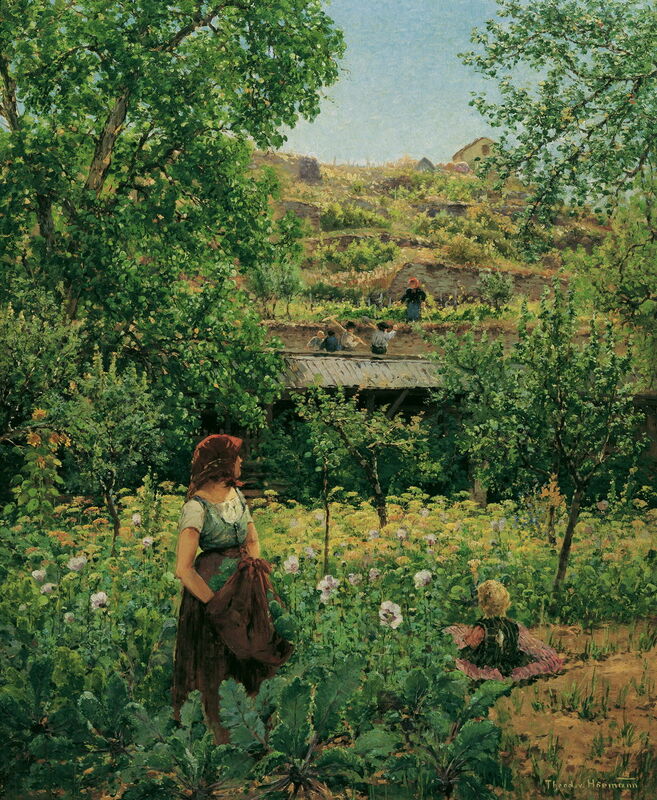 Most of his surviving paintings are small sketches, but there are some larger, more finished paintings such as Girl in Poppies from about 1892. The countryside shown here consists of small terraced fields on a steep hillside, probably not far from his home in Znaim. Theodor von Hörmann (1840–1895), Znaim in the Snow II (c 1892), oil on canvas, 78.5 x 100 cm, Österreichische Galerie Belvedere, Vienna, Austria. Wikimedia Commons. 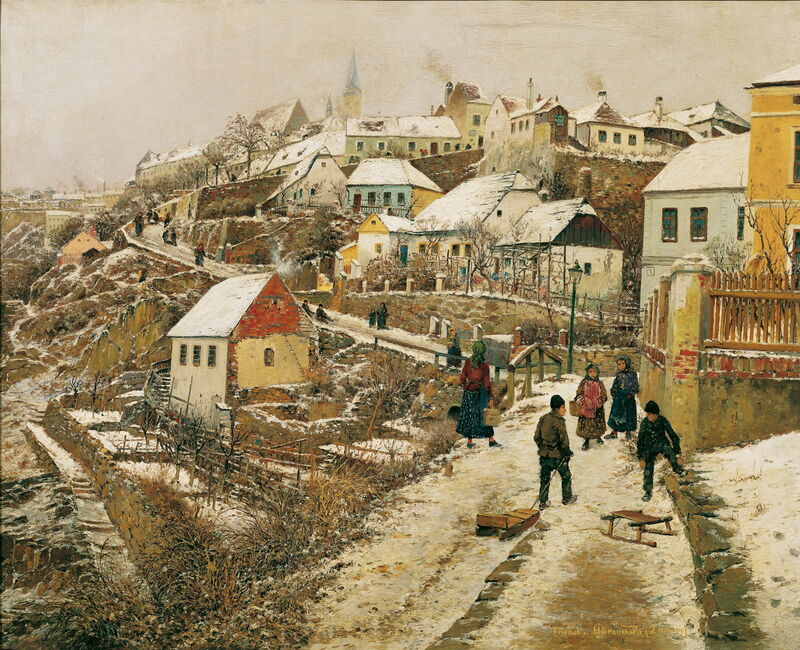 Znaim in the Snow II is another finely detailed painting from about 1892, and shows the steep streets of the town being used by children for sledging on a thin covering of packed snow. Theodor von Hörmann (1840–1895), Near Znaim – Inn with Outbuildings Surrounded by Fields and Meadows (date not known), oil on canvas, 39 x 55 cm, location not known. Wikimedia Commons. Near Znaim – Inn with Outbuildings Surrounded by Fields and Meadows is another view from this period, almost certainly painted in front of the motif. The figures on the road at the upper left seem disproportionately large in comparison with the nearer farmhouse. 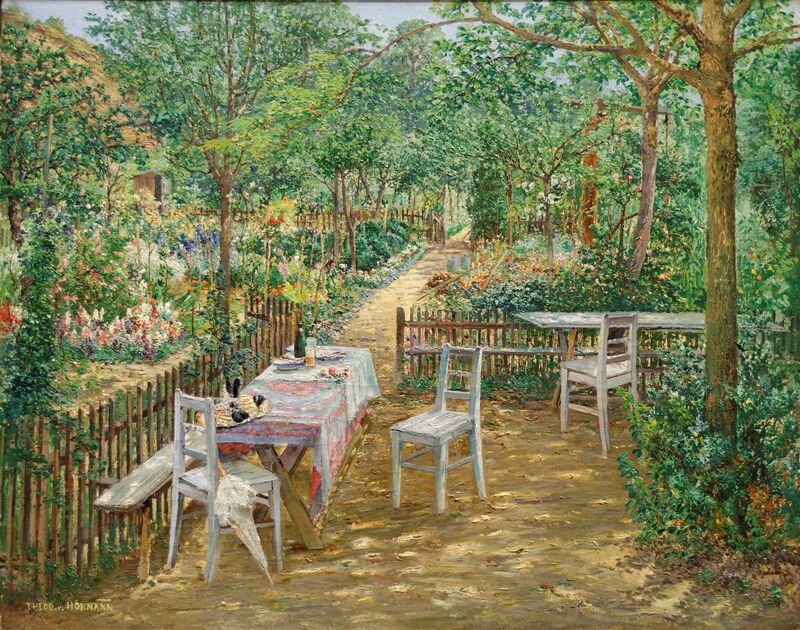 Summer in the Garden, Znaim, from about 1893, must be one of his finest works. It is brilliantly lit and detailed without losing its painterliness. On the table are the remains of a meal, with an abandoned hat and white parasol, begging the question as to who was there just a moment ago. 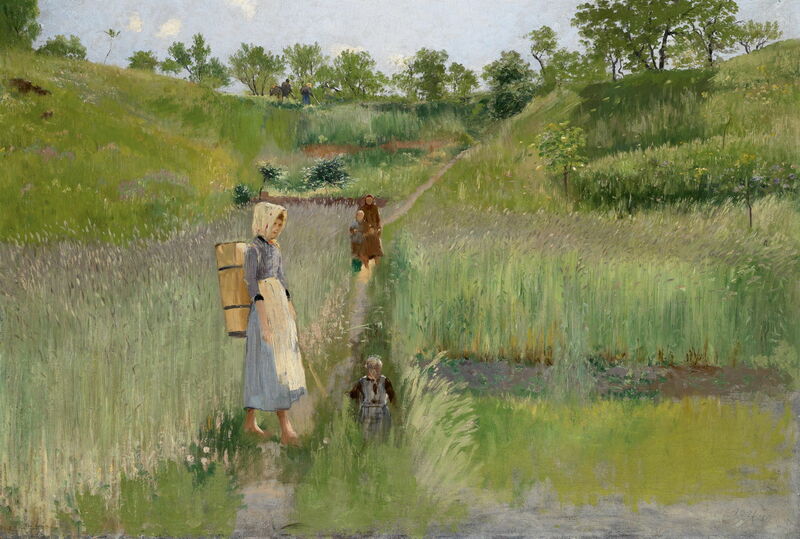 Theodor von Hörmann (1840–1895), Sainfoin Field at Znaim II (c 1893), media not known, 22 x 48 cm, Österreichische Galerie Belvedere, Vienna, Austria. Wikimedia Commons. Sainfoin Field at Znaim II also from about 1893 shows a crop now little-known: sainfoin, a chalk-loving forage crop which used to be important for working horses. This was a very quick oil sketch. In 1893, von Hörmann moved to Vienna, where he joined the Artists’ Society (Künstlerhaus) shortly before the Vienna Secession. Thirty-eight of his paintings were exhibited that year in Vienna. Theodor von Hörmann (1840–1895), Kneeling Farmer’s Wife with a Sickle (date not known), oil on canvas, 38 x 54 cm, location not known. Wikimedia Commons. 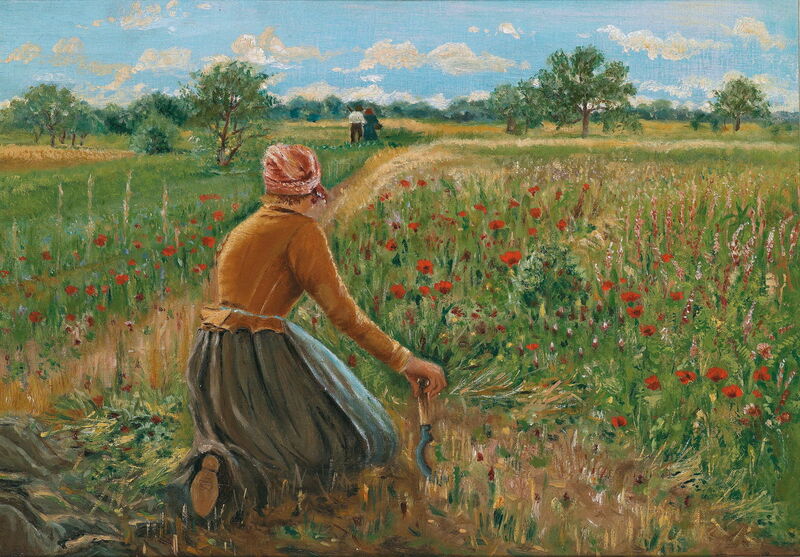 Seen amid poppies of more traditional colour, his Kneeling Farmer’s Wife with a Sickle is another of his finest works. It is unusual in that it is dominated by a figure, and not a pure landscape. The woman also looks away, towards two others standing in the distance, who are also facing away from the viewer. It suggests a narrative, which never resolves. Theodor von Hörmann (1840–1895), Avenue of Trees by a Stream (c 1893), oil on panel, 31 x 27 cm, location not known. Wikimedia Commons. 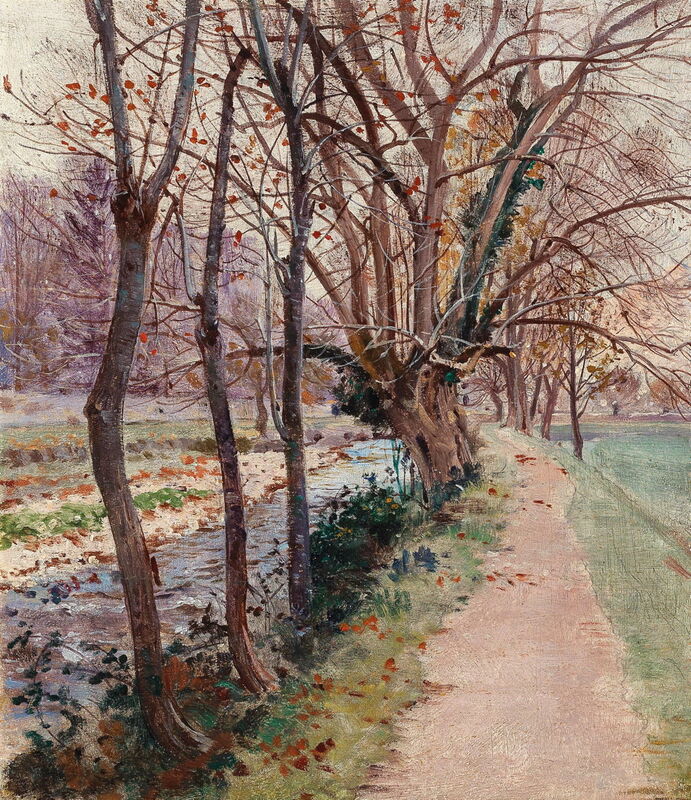 Also painted in flatter land, perhaps near Vienna, is this Avenue of Trees by a Stream from about 1893. Von Hörmann continued to travel from his home in Vienna, visiting Sicily and Venice in 1894. In July 1895, he had reached the southern city of Graz in Austria when returning from Italy when he died, at the age of 54, after a full-time career of just over a decade. He was remembered in an exhibition of 235 of his paintings, most of which were auctioned to establish a foundation for young artists. Posted in General, Life, Painting and tagged Austria, Impressionism, landscape, painting, plein air, Secession, von Hörmann. Bookmark the permalink. Thank you. I didn’t know these paintings. (Quite interesting, special; french-imp different light… Beautiful).